Eliza Scott isn't quite a slave, but she's not free either. She's not a prisoner, but her family lives in a jail. Eliza, who attends a secret floating school on the Mississippi River because it's illegal for her to read, says she understands how dangerous her situation is—but her parents know she's not afraid enough. When a devastating cholera epidemic strikes the city, Eliza discovers she will have to be clever and resourceful to escape a slave catcher and the worst fire in St. Louis' history. Will Eliza be willing to pay the price of freedom? 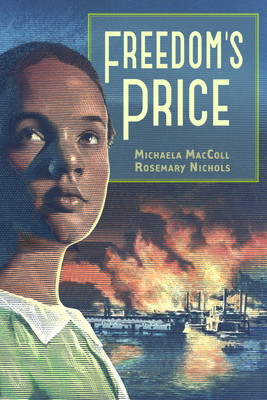 Freedom's Price is the second book in the Hidden Histories series, which examines little known moments in American history. Based on actual events and people, the book is extensively researched and includes an author's note and bibliography. Michaela MacColl is the award-winning writer of several historical fiction novels. She is the co-author of Rory's Promise, the first in the Hidden Histories series published by Calkins Creek. She and her family live in Westport, Connecticut. Visit michaelamaccoll.com. Rosemary Nichols's first novel was Rory's Promise with Michaela MacColl. She lives in Watervliet, New York. Visit rosemarygailnichols.com.